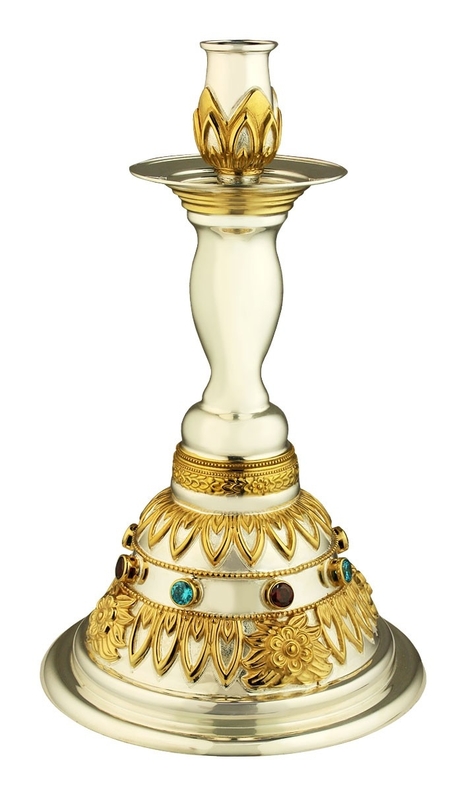 Church table candle-stand - A688 - Istok Church Supplies Corp.
Church altar table candlestick is made of brass and is covered with high quality silver plating, galvanized. This technology of metal deposition guarantees the permanent appearance of the product for a long time and provides easy maintenance. The candlestick is decorated with applique casted floral ornamentation and inserts of high-quality natural phianite stones, hand-bezel. The candlestick is accentuated by fragmentary gold-gilding. 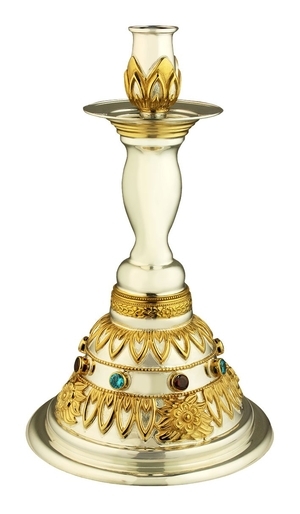 There is a matching altar lamp for this candlestick with SKU: VLA-0341LP. The product is sold in a presentable man-made leather package with a velvet lodgment.